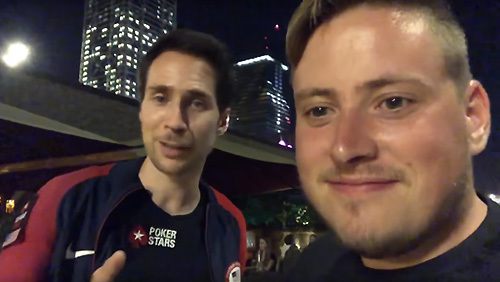 Another interview from the PokerStars European Poker Tour Barcelona, with Lee Davy sitting down with Jaime Staples to talk about his Platinum Poker Adventure: The Ultimate Sweat, and a few existential questions thrown in for good measure. I’m sitting in the media room. I can’t rise above the funk. He knew we had a commitment, and rather than let it slide – and he’s a busy, busy, bee – he came looking for me. I like this young man, more and more. Could you begin by giving me an update on your Platinum Pass Adventure (PPA) project? “PokerStars came to me with the opportunity to give away a $30k Platinum Pass, so we had to come up with an idea about how we would go about doing that,” Staples tells me. “We thought, that in honour of Ultimate Sweat we would create a challenge for life improvement. It’s not fair to have to be obese or underweight to do it, so we figured we’d make it about life improvement, so people can set their own challenges. “People have to set a challenge they would complete over three months, they have to document the process, and at the end, I will nominate five, and it goes to a jury vote. If you want to take a peek at the full list of entrants, and the weird and whacky challenges they intend to undergo, then here you are. If you’re unfamiliar with Jaime Staples, spend six minutes watching this video. After watching it, it dawned on me that for broadcasters such as Staples, you can easily suffer from Truman Show Syndrome. At what point does your life stop being ‘content’, and instead, becomes ‘life’? And how much pressure is there on broadcasters to set high standards, personally and professionally, and maintain that standard. Where does ego fit in? What happens when we start behaving out of alignment to our core values? It’s enough to drive people to the counselling couch, and Staples recently did just that and shared his lightbulb moments on Twitter, so I ask him if he wouldn’t mind sharing his experience. “Since the Ultimate Sweat I, I have embarked on a new challenge: Ultimate Sweat II, and it hasn’t gone as smoothly as the first one. I made some big changes right after I attempted to quit smoking. I was successful for two months and put on a lot of weight during that process. Then I relapsed, and I am now smoking. Anxiety is something we all feel. It’s a necessary human condition. But how does it feel when your levels of anxiety reach a summit the body and mind have never climbed before? In Ultimate Sweat, I, Jaime and his brother Matt shook on a $150,000 prop bet with Bill Perkins that the pair would weight within one pound of each other in 12-months time. The Staples brothers won the bet. Jaime looked like a Calvin Klein model. The brothers didn’t have time to blow out the candles when Perkins offered them a double or nothing proposition. Reach 9.9% body fat within a year. Another $150,000 on the line. With all the Vlogs, streams, tweets, FB updates, and Instagram snaps, I wonder if the spotlight is beginning to burn into areas of Staples psyche that have forever remained in the shadows? I ask Staples if God (Universe, Thor, I don’t care) was to grant him one favour right now, what would he ask for? “Does it have to be for me?” Asks Staples? Poker is a zero-sum game. Staples doesn’t seem like a zero-sum guy. I ask him to recall the one thing he feels guilty about in life? Was there ever a time when Staples felt spiritually repressed? What about a time when Staples felt all alone? “I think before I started streaming, my issues regarding my weight, I didn’t think a lot of people really understood what that was like inside my brain,” says Staples. “I felt there was a lack of empathy from people on that issue. That was something I felt on my own. There is a great Smith’s tune that I love called There is a Light That Never Goes Out and there is a line I love firing into my comb in full Morrisey regalia. And if a double-decker bus, crashes into us. I ask Staples if a double-decker bus was to crash into us, what would have been his most valuable purchase to date. When there’s anxiety, there is a fear of something. I ask Staples where he thinks the majority of his fears come from? There was a time when Staples was just Staples, sitting in his bedroom, playing online poker, unknown to much of the world. Then he became one of the most popular broadcasters. Then PokerStars hired him. Then he joined Bill Perkins on the Loveboat. As Staples climbs each step, he becomes exposed to a more vibrant network of people, both intellectually, financially, and emotionally. Does this then have a negative sheen whereas he is always looking at what others are achieving and questioning if he is making the right moves? If Staples could rid the earth of one thing, what would it be and why? And finally, I ask Staples, if he were to decide today to do some serious soul-searching, what is the first question he would ask himself? And I hope after reading the answer to his last question, the tightness in his chest migrates to another world, because this young man, is doing well. The post EPT Barcelona: Jaime Staples on the Ultimate Sweat, fears, and anxiety appeared first on CalvinAyre.com.